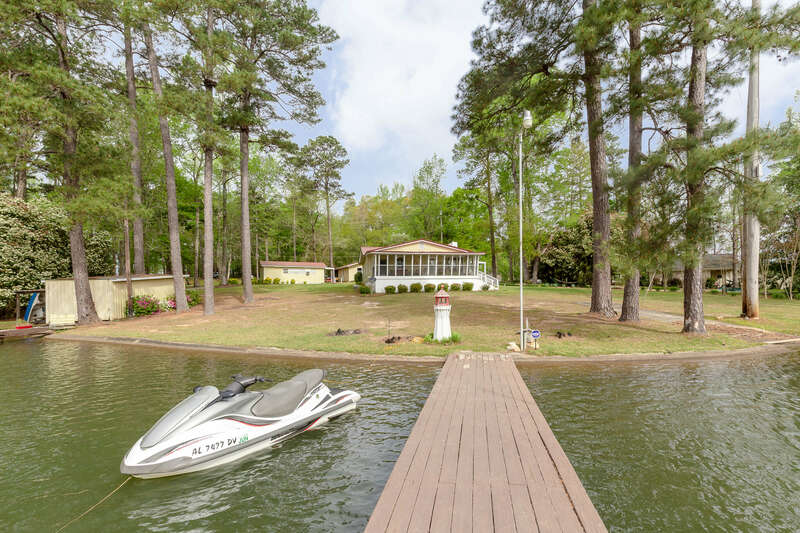 Come see what life on Lake Harding is all about! This property is truly outstanding w/ spectacular panoramic waterfront views- enjoy an afternoon of fishing from your private dock, take the boat out for some family fun (from your own boathouse) or just unwind on the sun porch while taking in the sights of the water - it's impossible to not fall in love w/ this charming getaway! The side deck is ideal for outdoor entertaining & two outbuildings provide space for guests, a workshop or more! This fantastic open floor plan makes for easy every day living. The updated kitchen features a dining area & great cabinet storage all overlooking the great room w/ lots of natural light & exquisite water views. The master includes a beautifully renovated ensuite bath! The additional bedrooms & gorgeous renovated bath complete this home. A dock, boat house, private launch & more; this is a dream! !